The company holds managers accountable not only for running a successful hotel but also for taking care of the employees who work in it. Organizations around the world are falling short of their growth potential. Just 13% of employees are engaged in their jobs, and actively disengaged workers outnumber engaged workers nearly two to one. These statistics suggest that the world is full of miserable, unproductive workplaces. But some companies are trying to change that. Hotel management firm Winegardner & Hammons, Inc. is one such company, and it has an impressive track record of engaging its employees. With 15 engaged employees for every actively disengaged employee, the company has garnered a Gallup Great Workplace Award (GGWA) for eight consecutive years. Only two other companies equal this streak. Here are four keys to Winegardner & Hammons' consistent success. Winegardner & Hammons believes that building a positive working environment for employees is essential to providing a superior guest experience, because employees who feel cared for at work are likely to take good care of their customers. This belief is so integral to the company's core mission that it is the first priority in its mission statement. To put this belief into practice, Winegardner & Hammons invests in its people and their long-term growth with training and internship opportunities to help them reach their professional goals. The company is also committed to promoting qualified candidates from within and treating every person in every role with dignity and respect. The company frequently recognizes employees' years of service and celebrates their achievements in its newsletters, pep rallies, and award banquets. To ensure employees are successful, Winegardner & Hammons sets clear expectations for every job in the hotel within the framework of its mission, then puts employees in the right roles to execute on those expectations. Hiring, engaging, and developing talented employees is central to its strategy. "We know that the team that puts the best players on the field always wins," says Winegardner & Hammons Executive Vice President Kent Bruggeman. In the hospitality industry, employees play a pivotal role in making guests feel at home. Winegardner & Hammons believes that its hotels win repeat business because of knowledgeable, friendly employees who promptly resolve guests' problems. Some job candidates are better suited to make this happen than others, and the company needed a way to find them. Bruggeman says the experience turned his company's senior leaders into believers. And they began thinking about the impact they could achieve by replicating top performers in key roles across all Winegardner & Hammons properties. "Those talent indicators are real," he said. "To discount them is foolish." Winegardner & Hammons began working with Gallup to devise a talent selection program for the hotels it manages. Gallup rigorously studied the company's most successful performers to design a set of customized selection tools that identify the applicants with the highest potential for success in specific roles. Bruggeman believes that the talent instruments have helped Winegardner & Hammons crack the code of identifying people who are the right fit for his company. "If we had to give up every tool [we use] but one, I would keep our selection instrument," he says. Hiring great managers is key to Winegardner & Hammons' strategy because the company holds managers accountable not only for running a successful hotel but also for taking care of the employees who work in it. And the focus on talent doesn't stop there. Every employee, whether a housekeeper, front desk clerk, or parking attendant, is screened by a selection tool appropriate to the role before being hired. The company insists on this because it considers the quality of its employees a key differentiator for its brand. Winegardner & Hammons' talent selection process has elevated the overall quality of its workforce. But the company understands that its employees could become disengaged if its culture doesn't support their success. Given the company's considerable investment in bringing the right people onboard, its leaders definitely wanted to retain them. So it partnered with Gallup to launch a company-wide employee engagement program. Because managers are most responsible for engaging employees, Winegardner & Hammons makes investing in managers the linchpin of its engagement strategy. The company hires managers with the talent to motivate and engage others. And it goes to great lengths to make sure they gain the knowledge, skills, and experience they need to capitalize on that talent. For instance, Winegardner & Hammons offers a rigorous 16-month course, "Fast Track to General Manager," that prepares candidates to handle the business of running a hotel while nurturing an engaging work environment. Winegardner & Hammons holds managers accountable for sustaining momentum on engagement throughout the year, not just when the Q12 employee engagement survey is running. Managers receive a balanced scorecard with key metrics each month and must meet certain requirements -- including employee engagement targets -- to earn bonuses, merit increases, and opportunities to advance. But managers aren't in it alone. Winegardner & Hammons ensures that leaders spend time supporting and developing managers and helping employees take responsibility for their own engagement. Beginning with their first day on the job, employees receive a copy of the Q12 items and are challenged to maintain an open dialogue with managers and peers about their needs on each of the engagement items and to participate in action planning. The company's commitment to engagement has paid off. Winegardner & Hammons' overall engagement score places it in the top 10% of companies in Gallup's global employee engagement database. 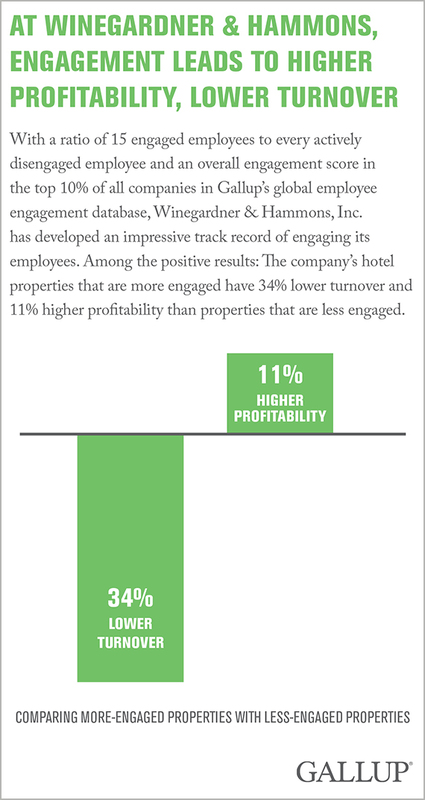 And analysis shows that the company's hotel properties that are more engaged have 35% lower turnover and 11% higher profitability than properties that are less engaged. Though selection and engagement are pillars of Winegardner & Hammons' operating strategy, strengths-based development is more of a grass-roots movement, according to Bruggeman. He says general managers are given considerable autonomy when it comes to finding what works at their location. 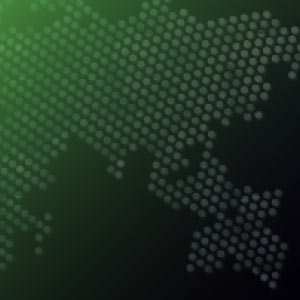 But more of them are using Gallup's Clifton StrengthsFinder, an online assessment that reveals users' top talent themes, to develop their employees. "I carry the list of strengths themes for everyone on my team in my briefcase," Bruggeman says. When an employee doesn't shine in his or her role, that person's StrengthsFinder themes can offer clues as to why. For instance, when one clerk proved far less productive at checking in guests than others, her manager, Dave Smith, reviewed her themes and realized her dominant talents for communicating and for building relationships were slowing her work at the front desk, where efficiency is prized. So he moved her to a concierge position, where her natural friendliness and gift for banter are seen as strengths rather than weaknesses. Since finding a better fit for her talent, not only is she happier, she is more engaged and productive and better able to engage customers, as evidenced by the positive comment cards the company frequently receives about her, Bruggeman says. This, in a nutshell, is what maximizing talent is all about, and it illustrates why Winegardner & Hammons has one of the highest scores in Gallup's global database for the employee engagement item "At work, I have the opportunity to do what I do best every day." Smith's engagement-centered, strengths-based approach to managing earned him a nomination for Gallup's Great Manager Award this year, while Winegardner & Hammons' exceptional dedication to selecting and nurturing talent earned the company Gallup's first-ever Talent Maximization Award. Bruggeman admits that maximizing talent might seem unimportant at first glance, but he attributes Winegardner & Hammons' high customer ratings and financial success to the intangible qualities its employees contribute. And he has yet to find another company that duplicates Winegardner & Hammons' culture. "Not enough organizations pay attention to having and fielding the best people," Bruggeman says. "We do our best to keep it simple." Claire Kenkel is a Senior Consultant at Gallup.